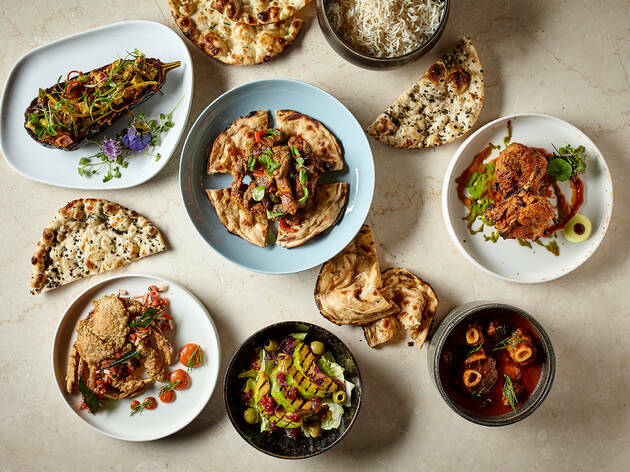 March 2019: We’ve added super vibey Indian barbecue restaurant Brigadiers at Bloomberg Arcade, the Brixton branch of small plate purveyors Kricket, then the great-value fare at India Club and two fancy fine-diners: Kutir, and the recently revamped Tamarind. London’s sprawling Indian food scene runs a gamut of regional styles and specialities, with a Bollywood symphony of fantastic flavours. 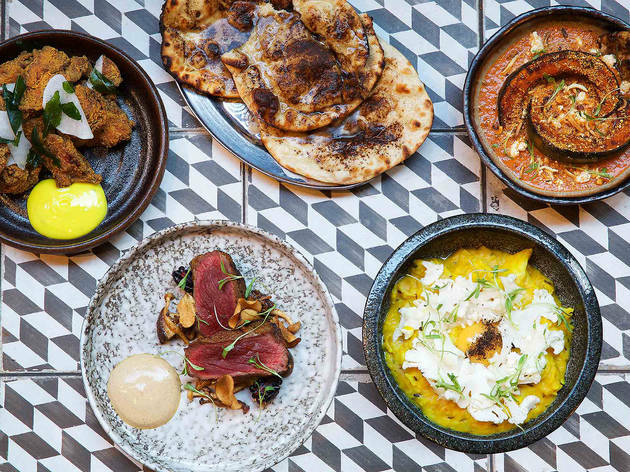 From homely dhal dishes to upscale, offal-laced keema and Punjabi-fired meats worth getting in line for, our list of London’s best Indian restaurants – some of which feature in our wider lists of London’s finest eateries and dishes – means you’ll never suffer a bog-standard Brick Lane curry again. 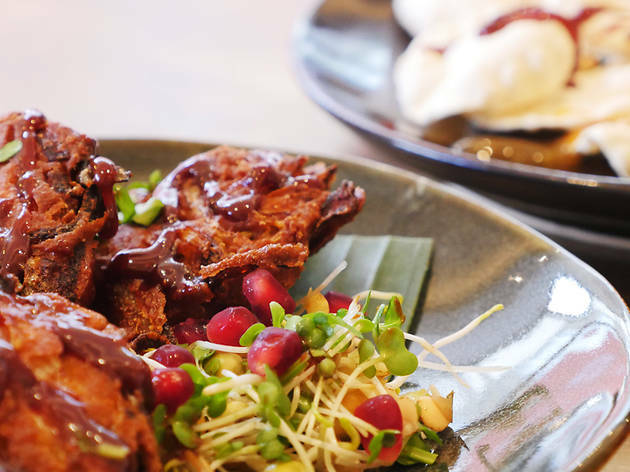 Specialising in stylish pan-Indian tapas, Amaya is favoured by a clientele of well-heeled professionals blessed with good taste and deep pockets. 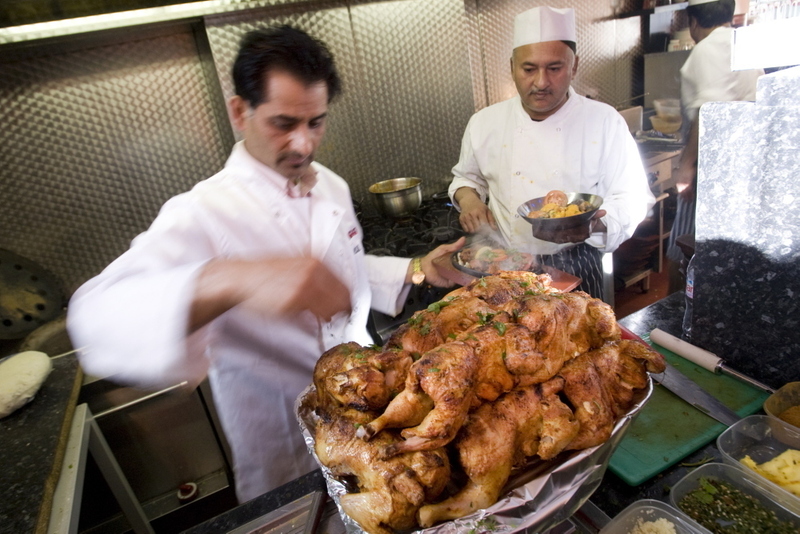 Ask for a table by the open kitchen for a view of chefs working the clay tandoor, charcoal grill and griddle. Amaya’s own-made paneer is outstanding and beef makes a surprise appearance in a splendid sirloin boti. Apollo Banana Leaf is an authentic rendering of South Indian and Sri Lankan cuisine – and great value. Though prices have increased, they remain fantastically keen: especially when you factor in the BYO policy. Spices are at authentic Jaffna (north Sri Lankan) levels: a single chilli icon on the menu is to be taken seriously; more than two is for the brave. Try the rich, warmly spiced crab masala – served claws and all. It’s love at first whiff once you step inside this casual offshoot of swish Jamavar. There’s plenty of bustle and noisy chatter, while the smoky aromas speak of killer Indian cooking. Our current faves? 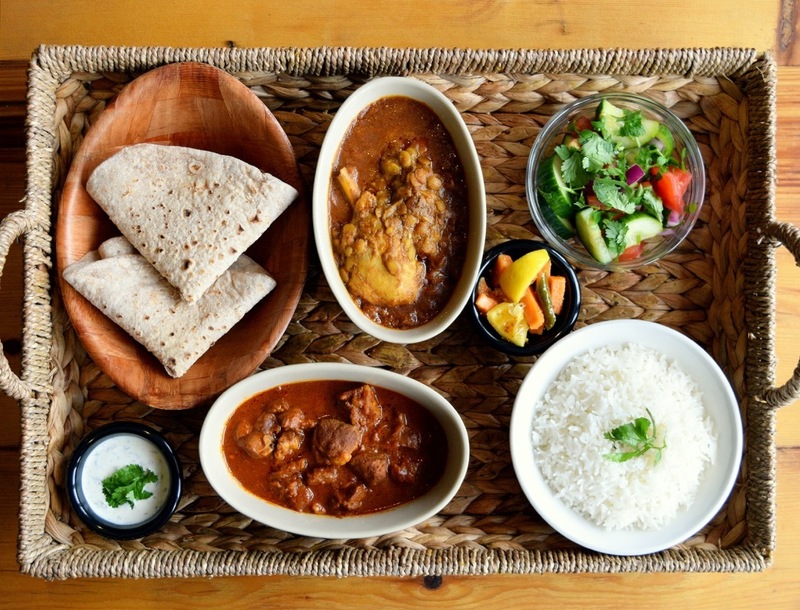 The dense lamb keema served with buttered buns, the Goan-style stone bass tikka, the moist, chunky lamb biryani, and – of course – the rich, mellow dhal. 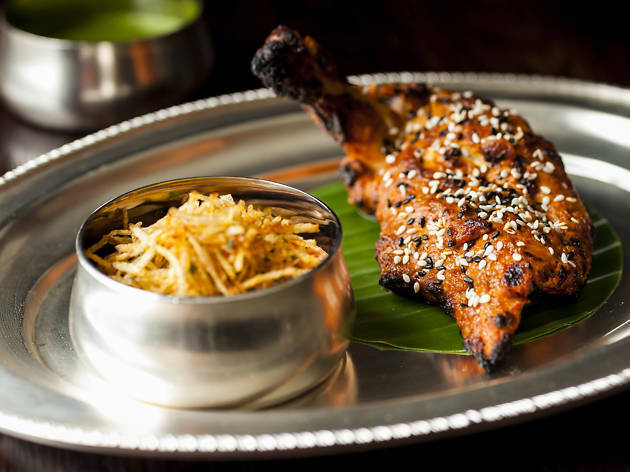 Bombay Bustle is also darned affordable by Mayfair standards – and it’s great fun. What does every self-respecting curryhead need to complement their favourite meal of the week? 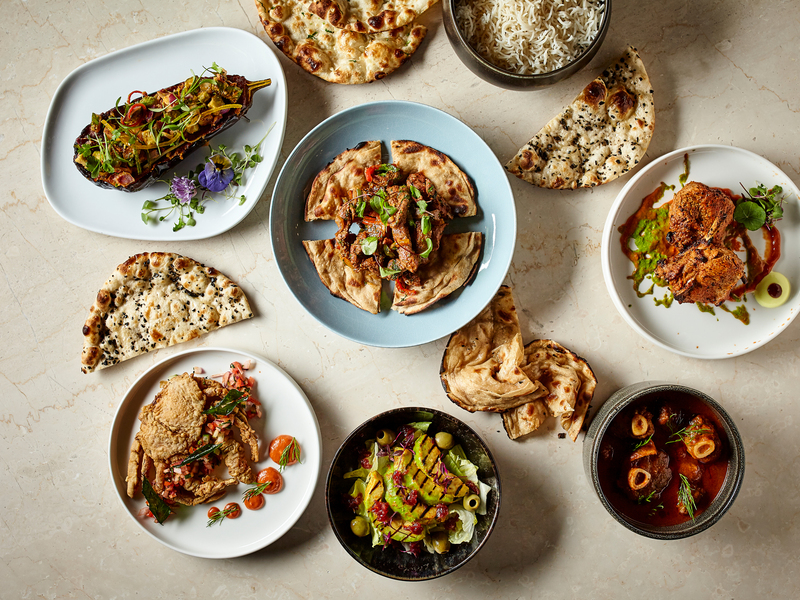 Lashings of beer, of course – and at this modern cuzza house serving north-Indian small plates, they take the bevvies as seriously as they do the food. 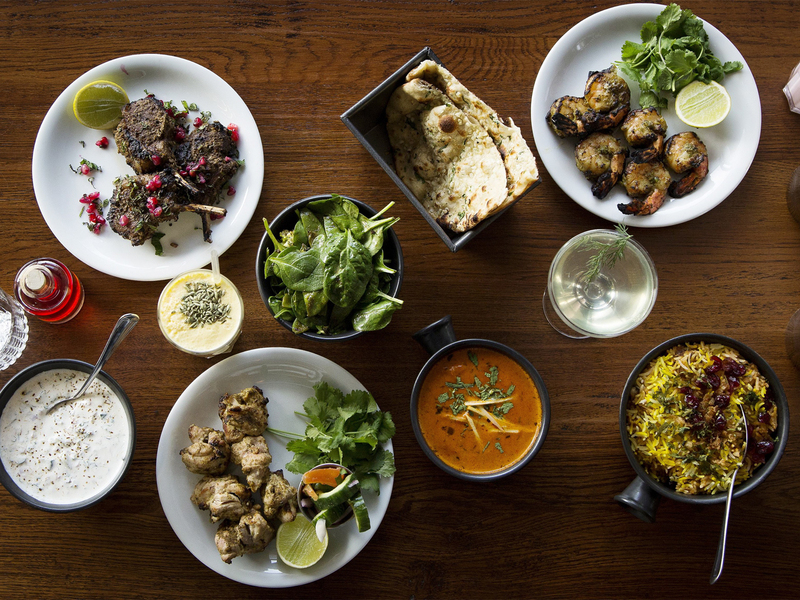 Order standard-bearing favourites – excellent onion bhajis, rich black lentils, succulent tandoor-charred lamb chops – then nab yourself a third or two-third measure of the ales, ciders and stouts on the beer taps in the dining room. Ba ba booma! You could call Brigadiers ‘Hoppers for people with money’. Not because there’s any similarity between the menus, but because this Indian barbecue restaurant has all the hallmarks of the Sethi empire (the mastermind behind Gymkhana, Trishna and Bao). Service, for instance, is super-slick but friendly. Don’t miss the dinky Indo-Chinese chicken lettuce wraps, or the fried fish pao, which is like an Indian take on a fish finger sarnie. The glitzy interior doesn’t hint at Brilliant’s longevity, but this Southall landmark has been trading for nigh-on 40 years. 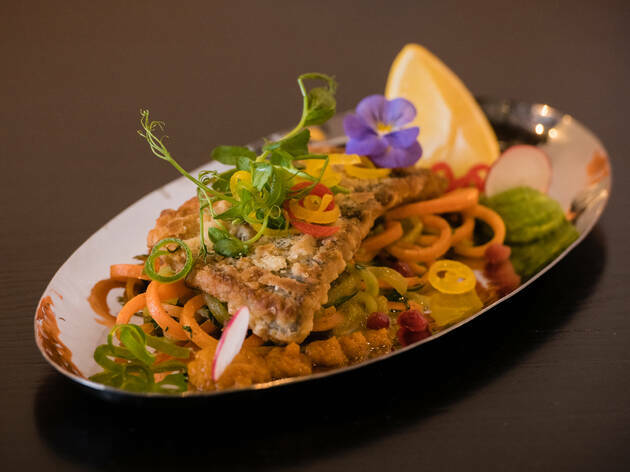 The owners, the Anand family, hail from Kenya, and the menu reflects this in starters of tandoori tilapia fish and mogo (cassava-root chips). Nevertheless, it’s for exemplary versions of straightforward Punjabi cooking that the restaurant has gained acclaim. 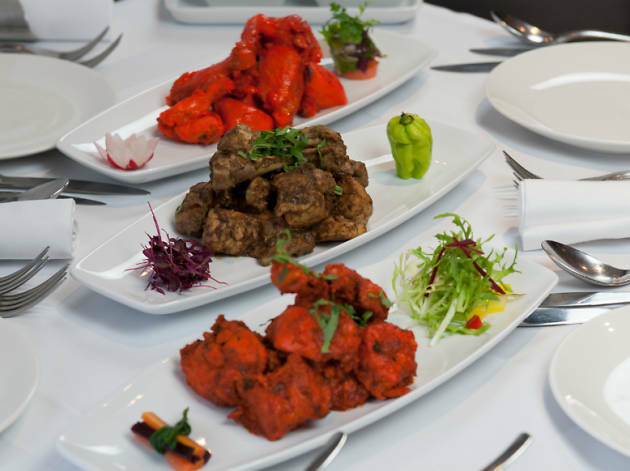 Fish pakora followed by methi chicken karahi remain sublime options. In a city where many of us still think of Indian food as an either/or situation (hottest thing on the menu lads/chicken korma wimps) it’s a pleasure to eat in a restaurant where the special spice blends are really allowed to sing. 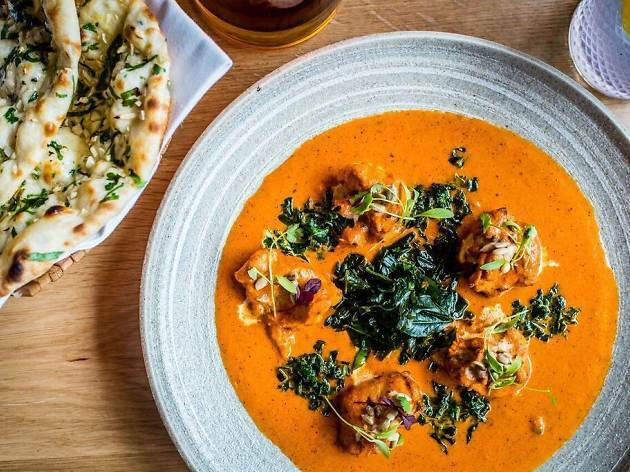 It’s frankly a surprise to find this in Canary Wharf, but once you’re in you can choose between eating Indian tapas in the Toddy Shop – the slightly less formal front section of the restaurant – and the more traditional dining area at the back, where you can order three courses. There’s a gentlemen’s club feel to this grand, Grade II-listed Victorian building. 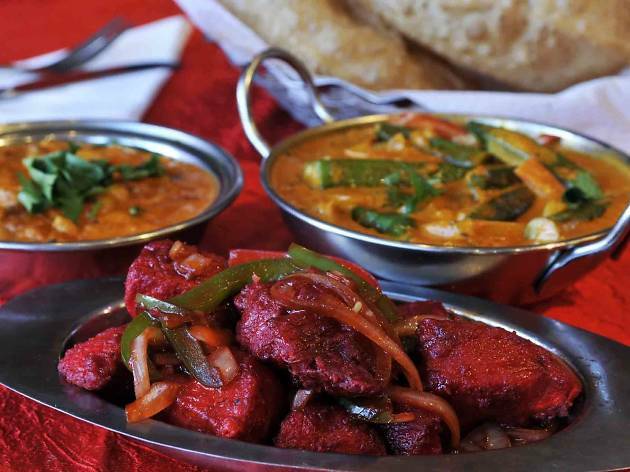 It’s an established haunt, with a fine-dining menu of updated rustic and regal pan-Indian dishes. 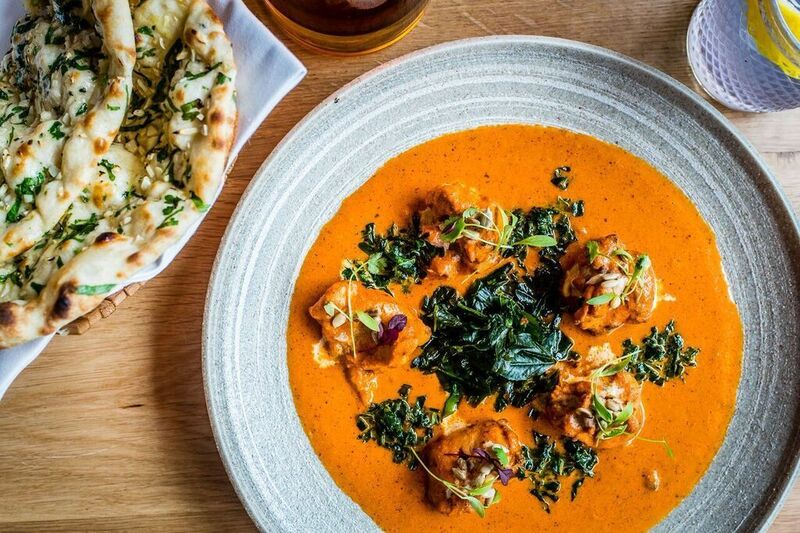 Cumbrian farmers have chef Vivek Singh to thank for his signature Herdwick lamb curry, the browned onion paste fried to a russet-brown and spiced with ginger, cardamom and fiery chillies. The kitchen also excels in seafood. Prices are pegged at the sharp end, although the set menus are affordable. 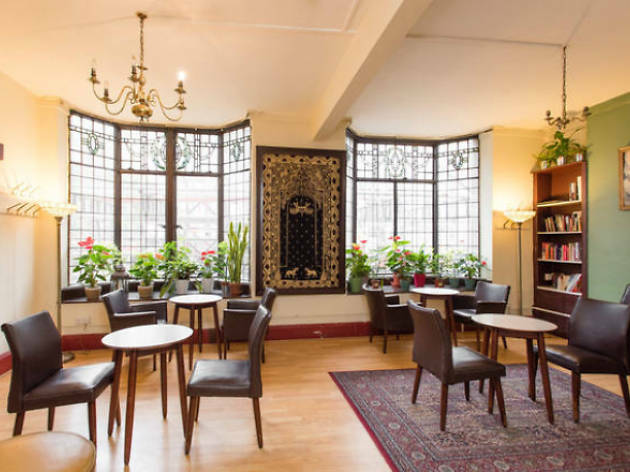 There’s something almost karmic about the location of this sibling to the Cinnamon Club, occupying as it does a former warehouse of the East India Company. And it occupies it stylishly, with walls in soft pewter hues inset with lustrous mother-of-pearl patterns. 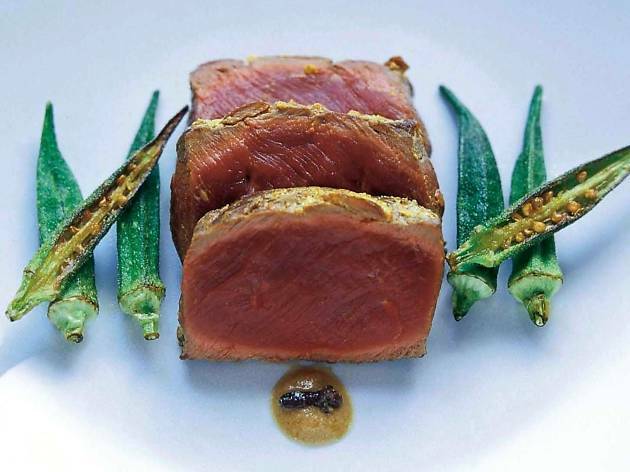 Most dishes emerging from the conventional kitchen are clever but not contrived. The menu might be fairly short, but the queue lining up for a taste of it is decidedly long. 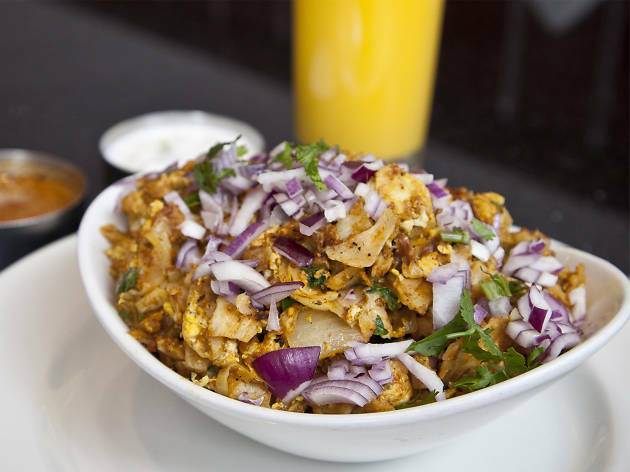 The newest outpost from the family behind Punjabi restaurant Brilliant in Southall, this casual, no-frills joint combines personable service with a short menu dominated by Indian sharing plates and hearty food. Get stuck in to the pan-fried sea bass, kicking with heat and served over a heap of curried veg, plus a plate of the cooling papri chaat. Just save some space for the stellar desserts. 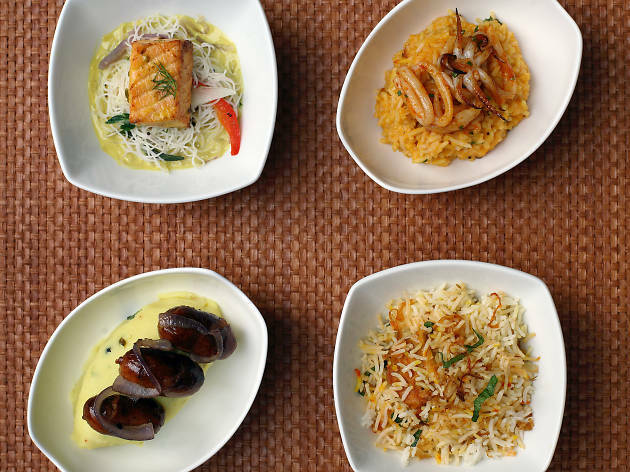 A swish brasserie in the style of the old post-colonial Irani cafés of Bombay. 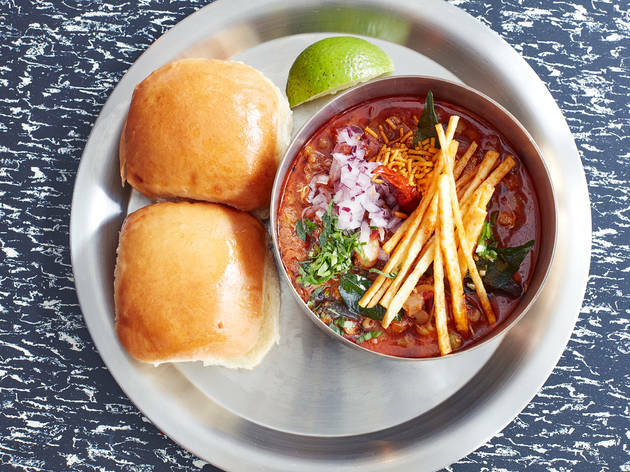 The main attraction is the menu, with biryanis, bhel (crunchy puffed rice with tangy tamarind chutney) and pau bhaji (toasted white bread rolls with a spicy vegetable stew as a filling). The black dhal and bacon naan are practically household names, causing queues for a table. 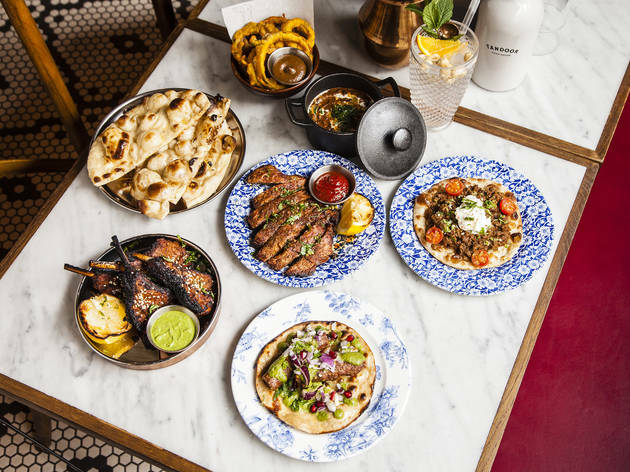 This Covent Garden branch began the Dishoom story, but all other branches – Shoreditch, King’s Cross, Kensington and Carnaby Street – get a holi high five from us. Rarely have we seen such a perfect dosa: crisp on the outside, moist and rice-fragrant on the inside, a perfect oval bent over in the shape of a curling leaf. The accompanying sambar (spicy lentil dip) is rich and sweet, in the Chennai style, and the coconut chutneys fresh. Most of the dosa cost under £5. It’s true that this South Indian and Sri Lankan café might not have the most alluring of interiors – it’s lit like a Tamil truck-stop – but at least you get to see movies on the flatscreen TV by way of diversion. 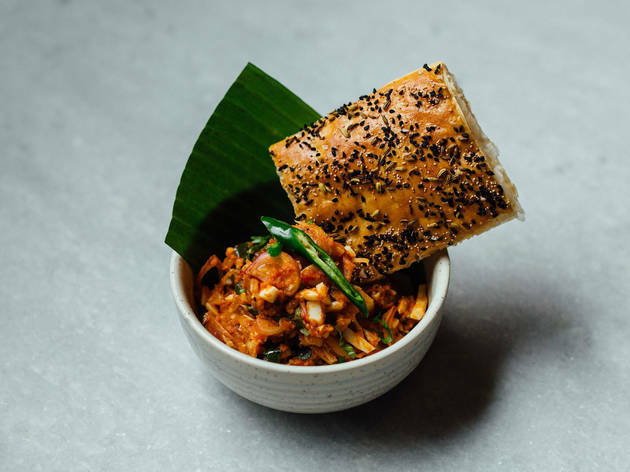 This tiny family-run restaurant headed by Nirmal Save, once a chef at Mayfair’s Tamarind, aims to defy the stranglehold of ‘bucket curries’ on the Brick Lane neighbourhood and bring quality small plates to Indian food. 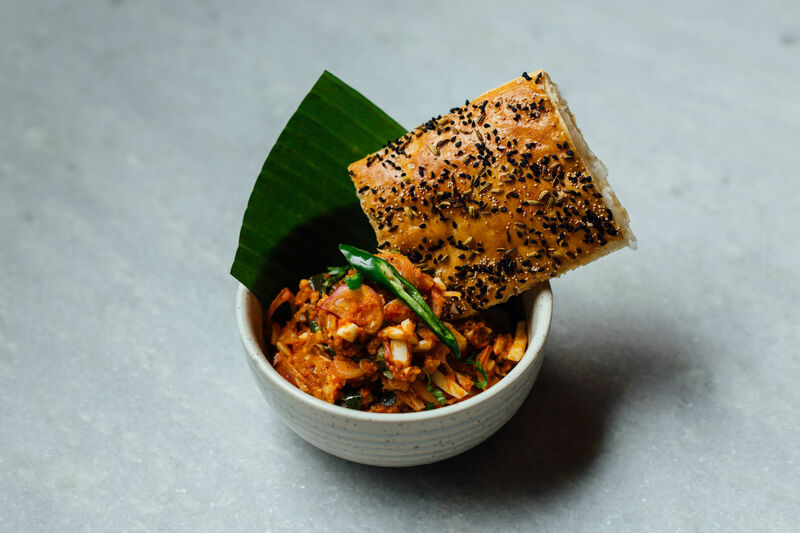 Gunpowder ditches stomach-bursting breads and sauces in favour of strong flavours and a menu of about 20 dishes from across India. 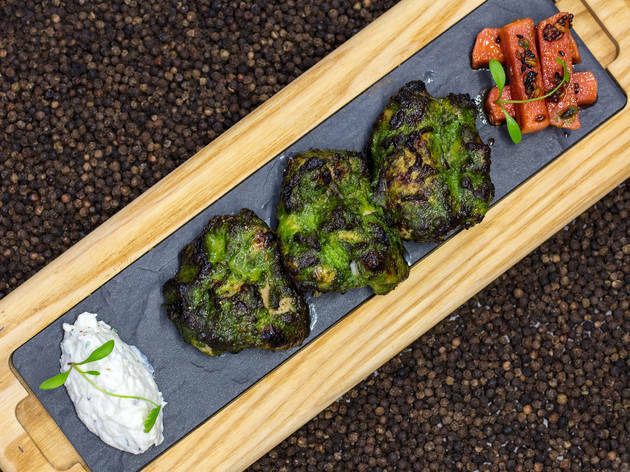 The chargilled tandoori chicken and Kashmiri lamb chops are excellent, and veggie options, including a sweet sigree-grilled mustard broccoli, are star turns. 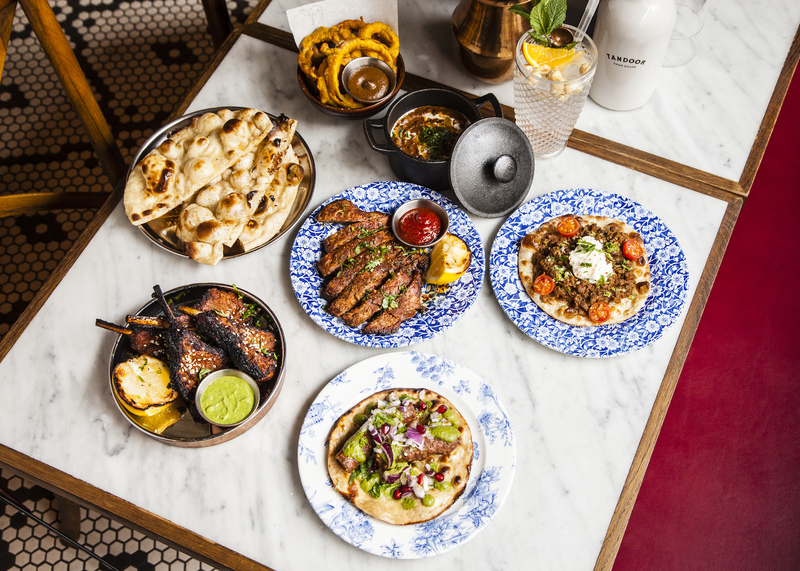 Gymkhana, from patron-chef Karam Sethi (also of Trishna and Hoppers – see both below) has the look and feel of an Indian colonial club with its retro ceiling fans, marble tabletops and photos of yesteryear. Bar staff theatrically deliver Indian punches in sealed medicine bottles, accompanied by silvery goblets. Sethi lays on a splendid spread of modern Indian dishes based on regional masalas and marinades. Find fried South Indian chicken wings, pork cheek vindaloo and game dishes – and don’t miss the muntjac biryani. 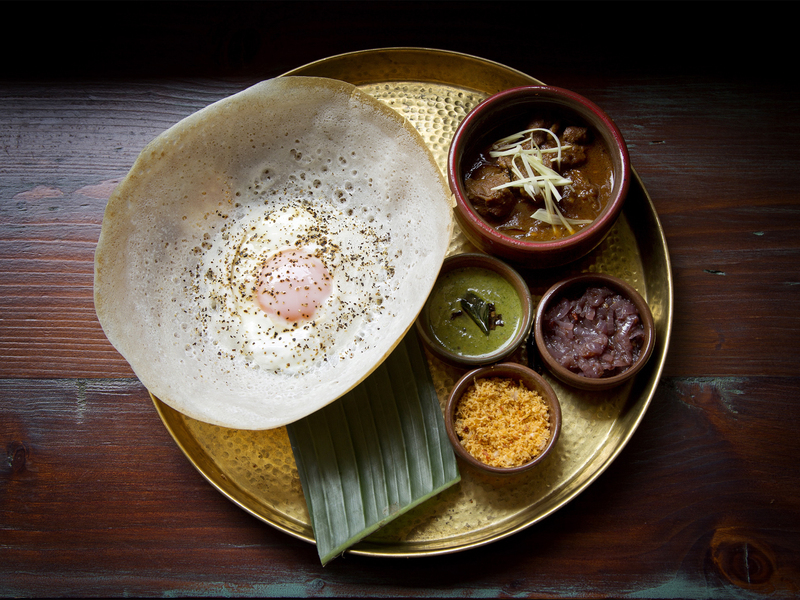 The Sethis strike again with this Sri Lankan restaurant, specialising in…well, you know, hoppers. 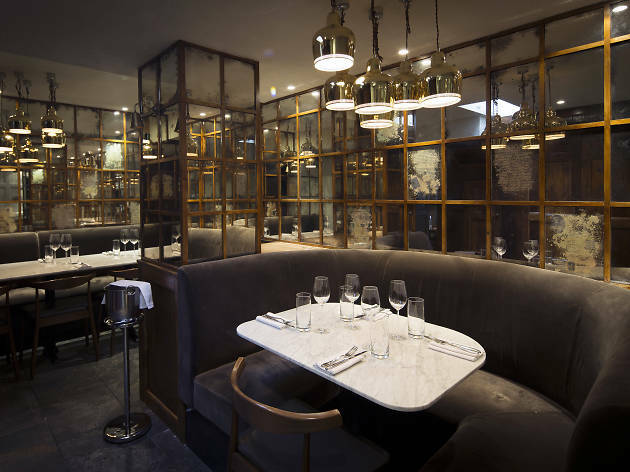 As you might expect from a no-bookings joint in Soho, it’s small but stylish. 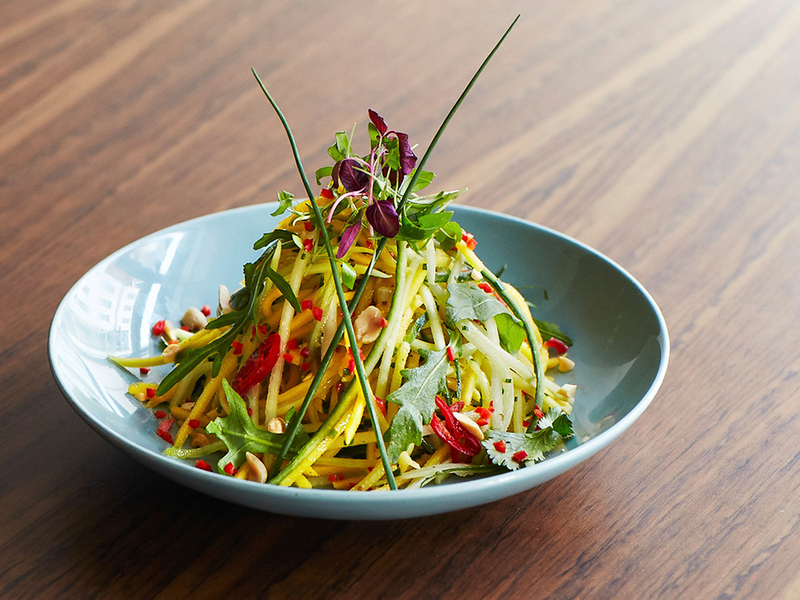 The menu is also stylish, taking on Indian and Sri Lankan cuisine. Slender breaded and deep-fried mutton rolls, roast bone marrow with a fiery ‘dry’ sauce and buttery roti, unapologetically spiced curries, and hoppers every which way. String hoppers (steamed rice noodle ‘pancakes’) come with not just a classic mild coconut pouring curry but with a terrific fresh coconut sambol. If you like your service polished and your surroundings swish, this smart Mayfair Indian will be right up your street. The creative, attractively plated food is pretty special, too. Go for the insanely tender pork ribs marinated with syrupy pickled mango, or a pot of slow-roasted lamb in ghee. Just hope someone else is paying. With roots in the India League, which campaigned for the country’s independence, the Club has been in residence at this address, upstairs at the Hotel Strand Continental, since 1946. The canteen-like fare is good (be sure to order the egg curry) and prices are fabulously easy on the pocket. As for the look, it’s a humble nod to colonial times: mustard walls, wipe-clean tables, and ornate metal lanterns overhead. 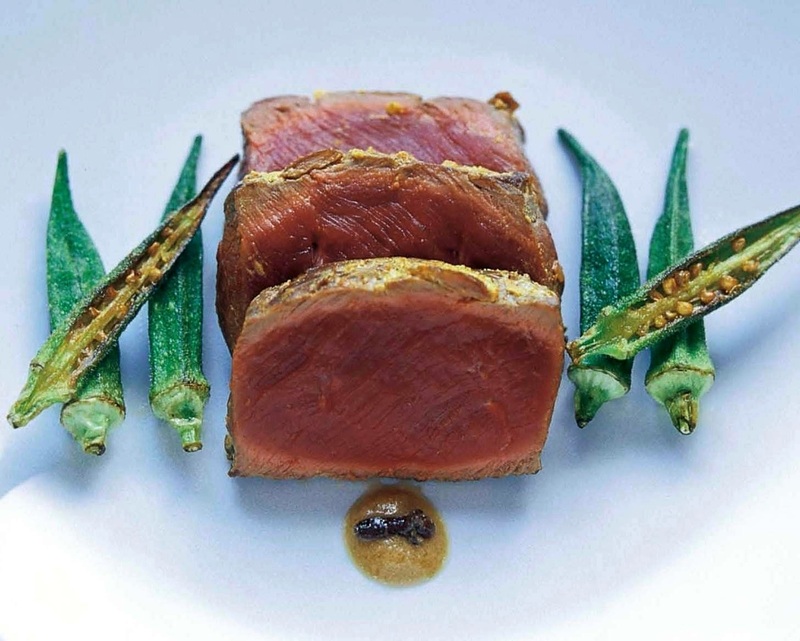 Jamavar’s vibe suggests a smart, colonial-era gentlemen’s club, but don’t let that put you off. 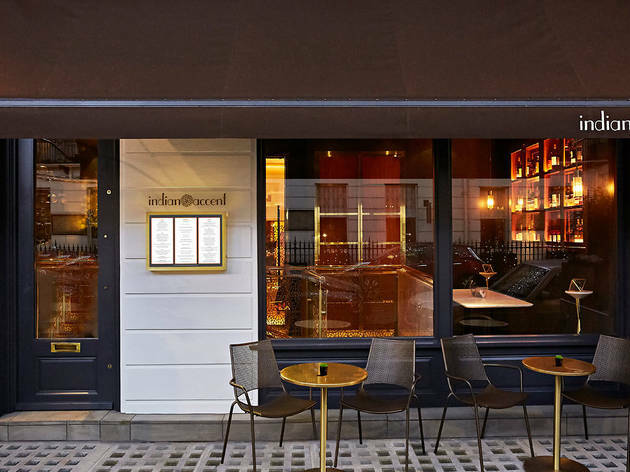 What makes it worth a serious punt is the Michelin-starred food – a succession of luscious, delicately spiced small plates bursting with purity and depth of flavour. We’re still salivating over the succulent lobster tail served with sambar and idli dumplings on the side. Yes, Jamavar is pricey, but it’s worth the outlay – if you don’t believe us, just try the ridiculously delicious mango rasmalai. 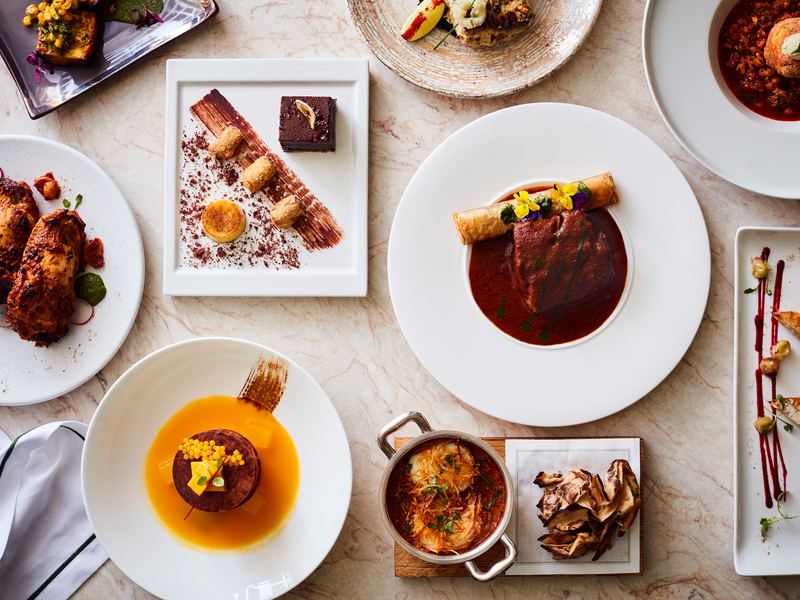 A smart newcomer from the former head chef of Mayfair’s Michelin-starred Tamarind, Kahani offers the option of small portions for most dishes which, happily, allows you to maraud around the menu trying a bit of everything. 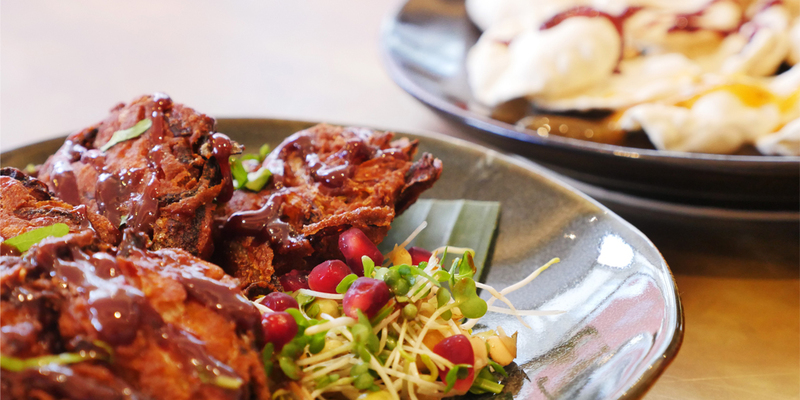 We love the mini samosa trio, Mangalorean-spiced soft-shell crab and smoky Malabar prawns. Staff can sometimes try too hard, and the room needs more bums on seats, but for classy modern Indian cooking, it’s a cracker. Fans were understandably distraught when the original shipping container Kricket in Brixton closed. But then came a bricks-and-mortar spot in Soho, and all was forgiven. Now, at last, the cool modern Indian has gone back to its SW9 roots, with a permanent branch south of the river. 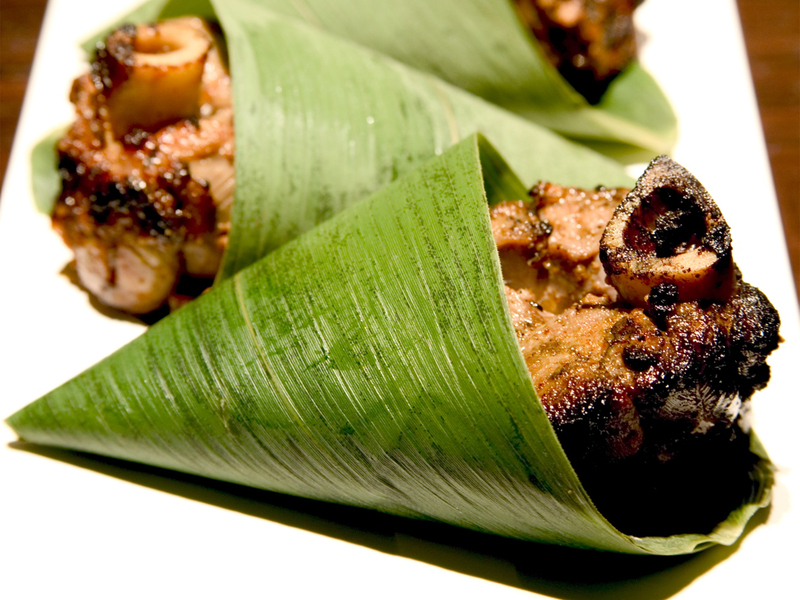 Go for the gutsy, fiery pulled pig’s head, but don’t forget a plate of the the signature Keralan fried chicken. Crunchy on the outside, tender in the middle, it’s as warmly spiced and wonderful as ever. Tucked away on a quiet backstreet just off the King’s Road, ex-Trishna and Jamavar chef Rohit Ghai’s first solo venture is a good-looking townhouse restaurant with plenty of polish. Seafood is a particular delight: think sea bass and mussel curry with thick coconut cream and curry leaves, or yoghurty, herb-infused fillet of stone bass with curls of crunchy squid. Go for the intimate atmos, sumptuous décor and food that won’t disappoint. Okay, so strictly speaking this is a Pakistani restaurant, but if you’re looking for curry, you’ve come to the right place. In fact, even though it might not look like much, Lahore Kebab House is a place of pilgrimage for curry lovers. 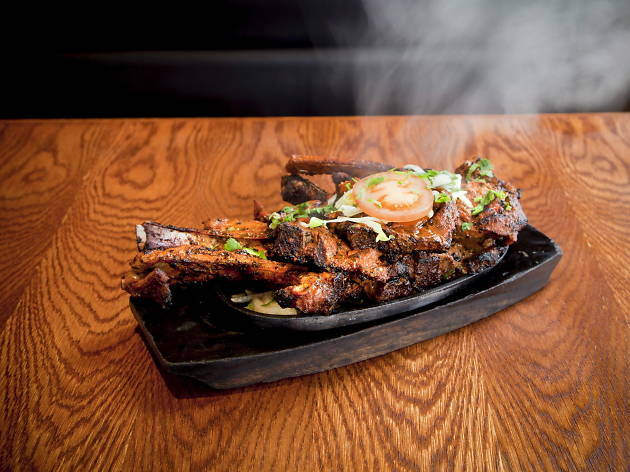 Queues snake out of the door at weekends, with diners travelling from far and wide to sample Punjabi-style tandoori grilled meat and generous portions of ghee-laden curry. Bargain prices, attentive service and a BYO policy just add to the draw. The house specials are worth ordering, especially the nihari and dry lamb curry. The mother-daughter team behind this family affair serve curries based on their Pakistani heritage, so this Soho-styled yet homely joint isn’t technically an Indian. But you’ll forgive us for blurring boundaries when you taste the offerings on the short menu of five-star bites – fire- and spice-filled lamb gosht; fragrant, smoky chickpea curry; excellent desserts – experience the pitch-perfect service, and reap the boozy rewards of the restaurant’s collaboration with Brockley Brewery (which developed a lager and a pale ale just for MWC). If you need a reason to visit Brockley, this is it. 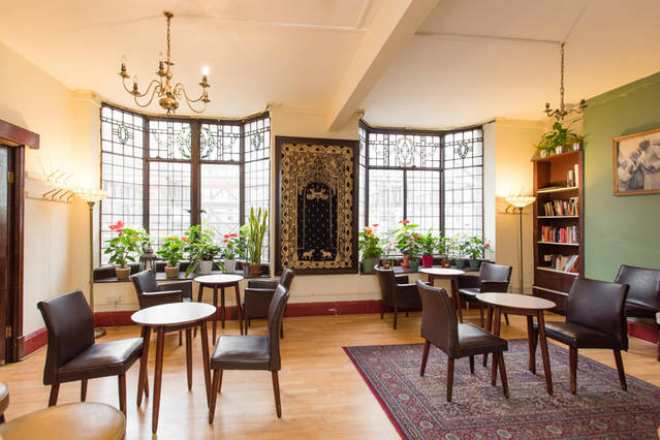 Opened in 2009 by a former Tayyabs manager, this squashed space doesn’t suffer from the same problem of endless queues, but it is just as gaudy. Yet with curries this good, the decor fades into the background. 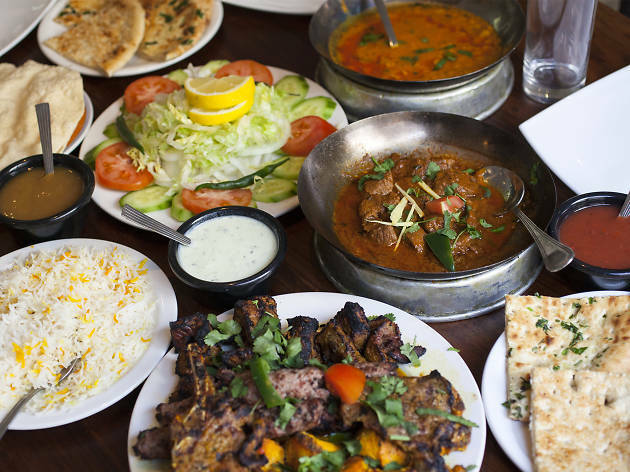 What you get are succulent karahi dishes and specials that include nihari (lamb on the bone) and a very passable biryani. Pakoras and other pre-prepared snacks can be disappointingly stale, but service is swift and friendly, and it’s hard to argue with the appeal of BYO and curries of such a high standard. The ‘concept’ at Talli Joe is to offer ‘Indian half plates + full drinks’. If that sounds contrived, don’t let it put you off. 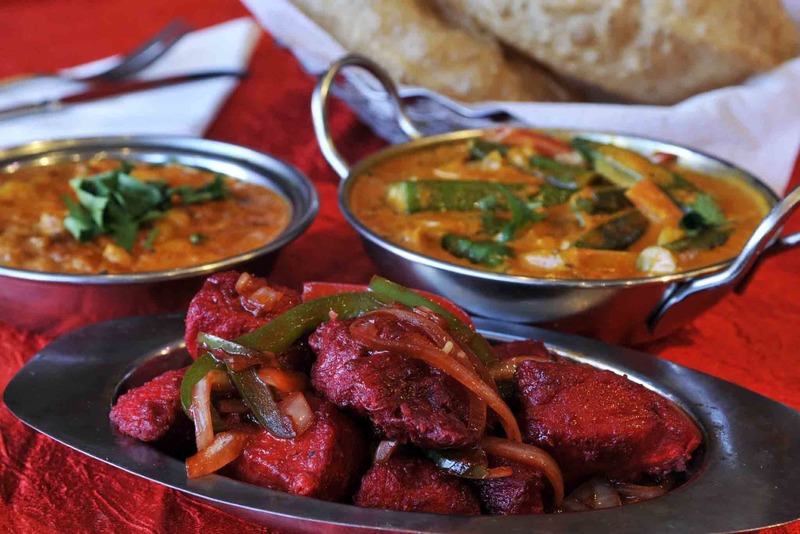 This regional Indian joint gets two crucial things right: the food and service. This is bright, bold cooking designed to enchant both tastebuds and soul, from the Goan pork and ‘offal’ curry to a crab ‘scotch egg’. For something more prosaic, try the seafood curry, which includes drumsticks – not chicken, but the green veg traditional in south Indian cooking. It’s this commitment to spot-on sourcing that gives Talli Joe its edge. Ever since it earned its first Michelin star in 2001, Tamarind has been one of the capital's most celebrated Indian restaurants. Now it's back, revamped and buzzier than ever. And the food is stunning. 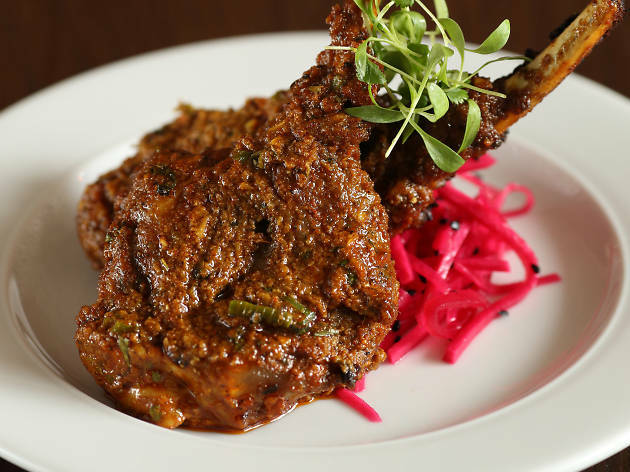 Order the likes of lentils spiked with fragrant mustard seeds, fiery stir-fried okra or slow-cooked goat chop curry. And don't miss the baked coconut rice. It’s seriously creamy, slightly spiced and comes topped with curls of young coconut and a fruity guava sorbet. Trust us: you ain’t never been to a chop house like this. 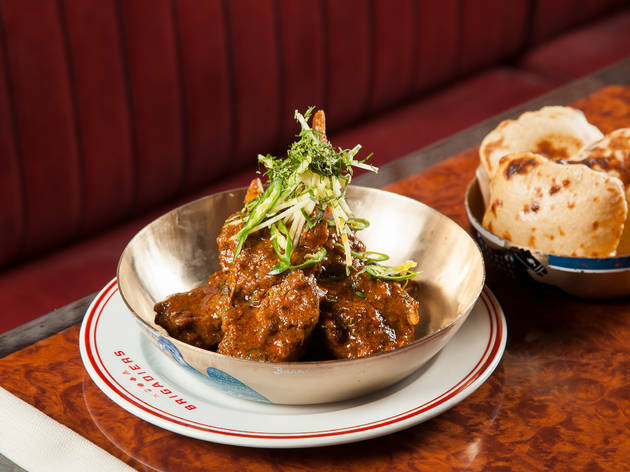 The meats here are spice-laden and tandoor-smoked, and all the better for it, while the industrial-style decor owes more to Bombay (via Dishoom) than Berni Inn. Almost every dish will make you swoon, but we defy you not to fall hard for the dexter beef keema naan – one of the most satisfying ways to invest a fiver here – or the decadent, nut-topped malted kulfi dessert. 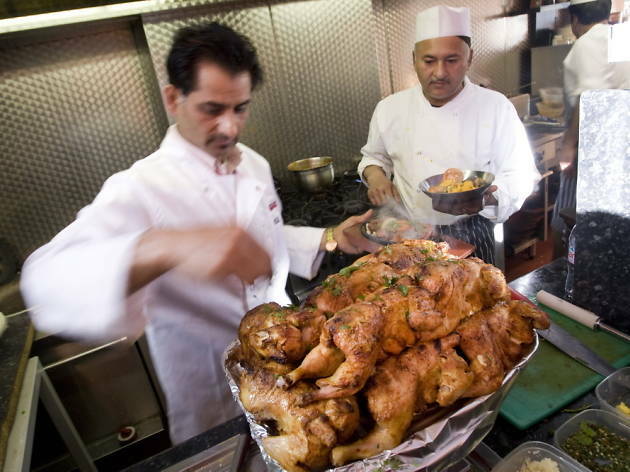 We’ve featured Tayyabs every year since it opened in 1972, and every year it gets busier. If you come here expecting a relaxing evening you’ll be disappointed. But we recommend this Punjabi stalwart because of the cheapness and unreserved boldness of the food. 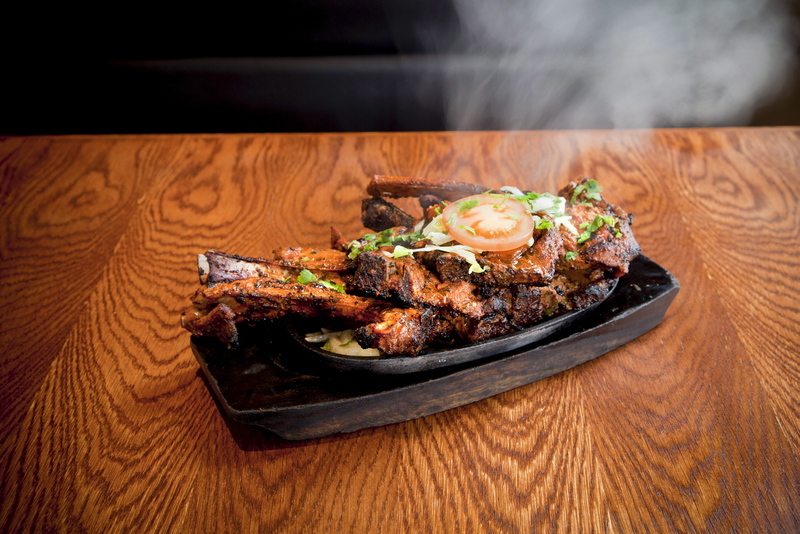 Definitely try the fiery grilled lamb chops, still one of London’s best dishes. The rest of the menu is all about rich dhals, slow-cooked curries and good versions of North Indian staples. And the corkage-free BYO policy doesn’t hurt. 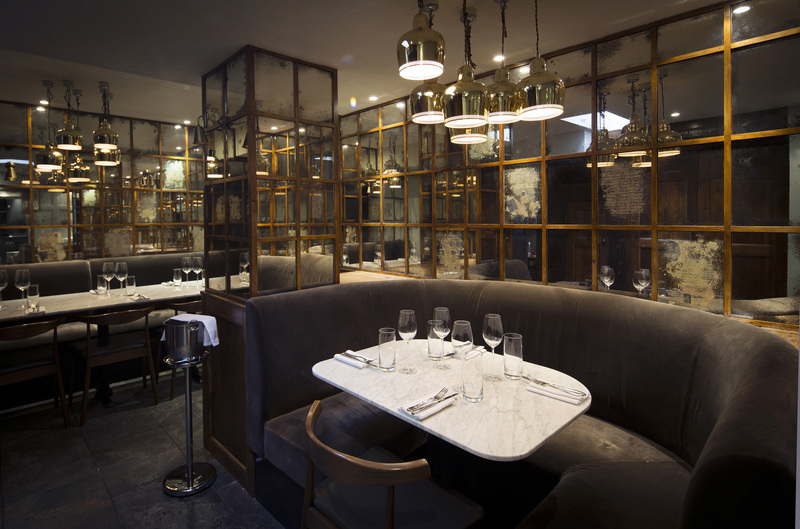 Gaining its first Michelin star in 2012, Trishna London is a world away from its shabby sister restaurant in Mumbai. 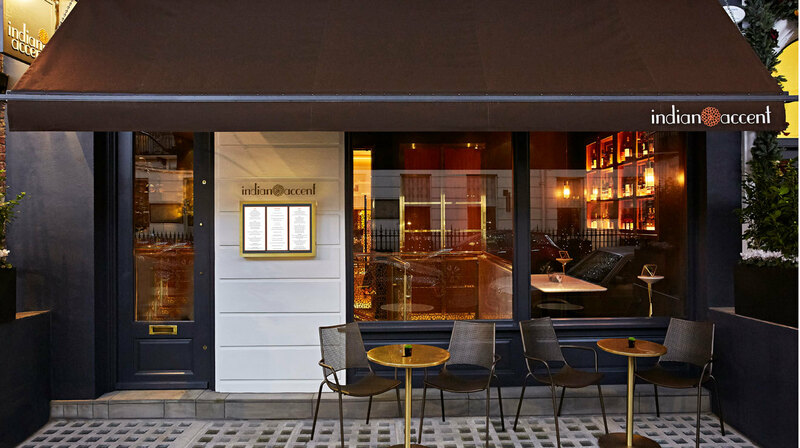 This contemporary-looking eatery is smart and quietly conservative, barely distinguishable from its Marylebone neighbours. The Mumbai original is known for its focus on seafood, but here equal prominence is given to meat and vegetarian dishes.